Non Toxique Lost: Pourquoi De Musique? Rerelease of this 1984 cassette. It was already licensed to Calypso Now back then, and now Sea Wanton supports us again by allowing this rerelease from the original master we used back then! 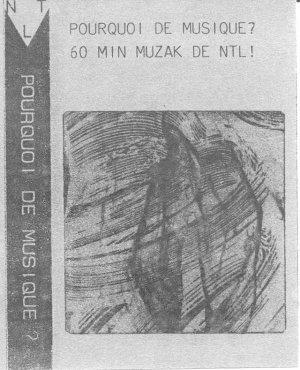 In my mind this was the strangest tape Non Toxique Lost released in their early days. It seems to be a compilation of other very early tapes, musically it starts rather calm, sometimes it even reminds me of Sonic Youth, it has a lot of Krautrock tradition in it too, then on side 2 it gets harsh and the synthesizers sound rusty. This tape did grow over the years since its first release in 1984. C60 chrome. First copies come in special laquered cassette!